Photograph 1. 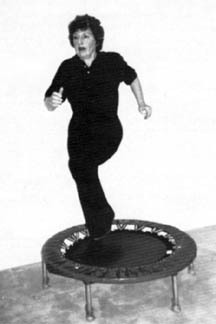 Shown is a deluxe NEEDAK® rebounding device on which and exerciser is jogging without feeling the jarring effect of landing on pavement. 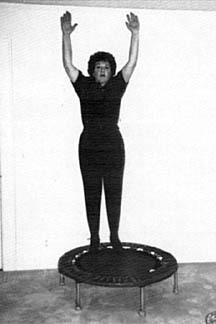 Rebounding is an exercise that reduces your body fat; firms your legs, thighs, abdomen, arms, and hips; increases your agility; improves your sense of balance; strengthens your muscles over all; provides an aerobic effect for your heart; rejuvenates your body when it's tired, and generally puts you in a state of health and fitness. 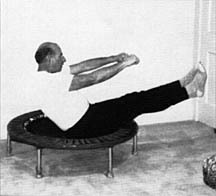 You can easily perform this exercise in your living room, your office, and your yard. The traveler may wish to carry a portable rebounder aboard an airliner for use in a hotel room. It's the most convenient, metabolically effective form of exercise around. 30. It reduces the likelihood of obesity. 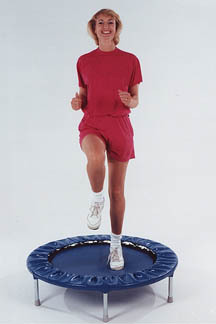 Rebounding involves aerobic movements performed on a bouncing device that looks like a small trampoline. It has you jumping up and down for health and fitness. As an ideal jumping device, the mini-trampoline or "rebounder," has a strong woven mat attached by coiled steel springs to a circular steel frame. The rebounder usually is round, although some models have been made oval, rectangular, square or polygonal. The entire jumping surface of the mat is twenty-eight inches in diameter, stands on six legs with spring coils of their own, which are seven to nine inches high. 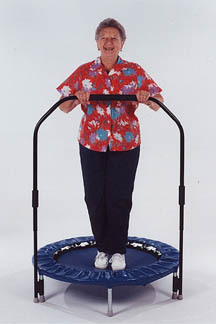 Sometimes, for people who feel unsteady on their feet or for the elderly, handicapped, and disabled, a stabilizing bar may be added to the rebounder's frame (see Photograph 2). It's attached to two of the frame's legs so that the individual needing more security can hold onto this bar and still bounce aerobically. Photograph 2. Shown is the NEEDAK® Soft Bounce™ rebounder with a stabilizing bar attached. This bar offers those who feel unsteady on their feet a greater sense of security while rebounding. 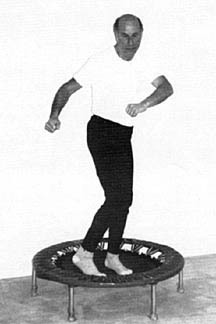 In jumping on a well-made rebounder, the exerciser usually feels invigorated and filled with a sense of well-being. People who rebound find they're able to work longer, sleep better, and feel less tense and nervous. The effect is not just psychological, because the action of bouncing up and down against gravity, without trauma to the musculoskeletal system, is one of the most beneficial aerobic exercises ever developed. Rebounding aerobics is working with gravity to cleanse your tissue cells and act as an oxygenator, which, in turn, lightens the load on the heart. Also it's fun to bounce! Much more than fun, however, rebounding provides a number of physiological pick-me-ups for the person who sustains this activity for at least ten minutes, four times a day, or for a single daily session for 40 minutes. As you bounce, your feet hit the mat with twice the force of gravity. Then just as the astronauts experience while floating in space, your body is in a state of weightlessness at the top of the bounce. Jumping on the mini-trampoline is remarkably un-strenuous on the Joints. There's no solid ground to suddenly stop the bouncing of your feet. Your movements are perfectly safe, and they make the effect of gravity beneficial. By working against constant gravitational pressure while bouncing, you resist the Earth's pull. Your resistance is subtle, but it builds cellular strength. Rebounding's alternating weightlessness and doublegravity produce a pumping action which pulls out waste products from the cells and forces into them, oxygen and nutrition from the bloodstream. If you have a resting heart rate of less than 60 beats a minute, don't smoke, don't have chest pain, live a healthful lifestyle, and engage in rebounding for 40 minutes or more each day, at least five days a week, theoretically it's not likely that you'll ever develop a heart problem if you have none now. Jumping on a rebounder helps you to attain your heart rate target zone every day that you rebound for the recommended 40 minutes. Your rate of rebounding will vary, depending on how vigorously you bounce and how high you lift your feet off the mat. Rebound exercise offers the ideal aerobic effect with almost any rate of performance, because it fills all the requisites of an oxygenating exercise. Rebounding might be considered a precursor movement for better achieving the oxygen therapies. 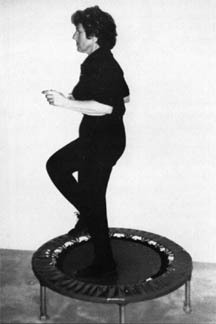 Rebounding offers a less stressful means of reducing body fat and simultaneously firming body tissues. Running in place on the rebounder burns calories effectively. According to a person's body weight, Table A shows how many calories from running on the rebounder may be expended per specified period of time in minutes. (1) The chart comes from research performed by Victor L. Katch, Ph.D., Dept. of Physical Education, University of Michigan at Ann Arbor. James White, Ph.D., director of research and rehabilitation in the physical education department at the University of California at San Diego (UCSD), has explained how jumping for health offers a true physical strengthening effect to the muscles. He said, "Rebounding allows the muscles to go through the full range of motion at equal force. It helps people learn to shift their weight properly and to be aware of body positions and balance." 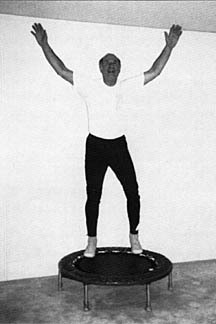 An advocate of rebounding for athletic conditioning, Dr. White uses the rebounder in his rehabilitation program at UCSD. "When you jump, jog, and twist on this (jumping) device you can exercise for hours without getting tired. It's great practice for skiing (see Photograph 9), it improves your tennis stroke, and it's a good way to burn off calories and lose weight," said Dr. White (see Table A). "My students tell me it's so much fun that they often exercise on the rebounders for their own enjoyment." Eight popular rebound movements are shown below (see Photographs 3, 4, 5, 6, 7, 8, 9 and 10). The gentle bounce of rebounding is effective in returning natural, regular bowel movements to chronically constipated persons. The steady bounce sets up a pulsating rhythm transmitted by the nervous system to the brain area responsible for regulating the intestinal system, which reestablishes one's rhythmical bowel activity. Digestion is improved as well. (2) The chart comes from research performed by Victor. L. Katch, Ph.D., Dept. of Physical Education, University of Michigan at Ann Arbor. Photograph 3. 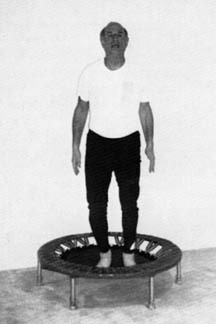 Shown is the author standing on a rebounder and engaged in a low bounce. This Health Bounce is a good warm-up exercise. 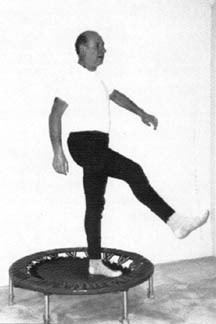 In the center of the rebounder, move up and down by using the toes and calf muscles. Your feet shouldn't leave the mat. Photograph 4. Jumping Jacks. Shown is the high bounce exercise of jumping jacks. Stand in the center of the rebounder with your feet together, hands at your sides. Jump to a position of feet apart, swinging arms to the side and up over your head. Keep arms straight. Return to starting position and repeat. Photograph 5. Running in place. In the center of the rebounder, start a walking, jogging, or running motion. Lift your knees high in front of you. Don't wait for the rebounder to bounce your leg up - run at your own speed. Photograph 6. The V-Bounce. Sitting in the middle of the rebounder, lift your legs to a 45 degree angle while your back is at a 45 degree angle. Using the motion of your arms, try bouncing without touch the rebounder with your hands. Photograph 7. High Bounce. Standing in the middle of the rebounder, use your toes and calves and bend your knees to bounce off the mat from four to ten inches vertically so that you land in the center of the rebounder. Photograph 10. The Twist. In the middle of the rebounder, bounce so that your hips and legs turn to the left and your chest and shoulders turn to the right. On the next bounce turn hips and legs to the right and chest and shoulders to the left. On the next bounce, reverse again.